NEW YORK — A federal jury in New York convicted a Hong Kong businessman Wednesday of bribing the presidents of two African nations to secure oil rights for a Chinese energy conglomerate. Ho's attorneys did not dispute that he made the payments, including $2 million secreted in gift boxes delivered to the president of Chad in 2014. But they insisted the transactions were charitable donations intended to foster goodwill in Chad and Uganda and expand the business of CEFC China Energy . The case stretched from the halls of the United Nations to the oilfields of sub-Saharan Africa, opening a window into the often blurry line between non-governmental organizations and private enterprise. Ho was charged and tried in New York, prosecutors said, because several relevant meetings, communications and wire transfers occurred in Manhattan. Prosecutors portrayed Ho, an ophthalmologist and former secretary for home affairs in Hong Kong, as an astute bagman who parlayed his position at the helm of CEFC China Energy's nonprofit think tank to befriend— and line the pockets of— government officials as the oil and gas company sought new business ventures around the world. "Running an NGO allowed the defendant to pass himself off as a humanitarian," Paul Hayden, a U.S. Justice Department trial attorney, told jurors at the outset of the trial. "He offered millions of dollars in bribes, and he did so to gain business." Ho's attorneys called the prosecution a "bribery case with no bribe." They insisted Ho took pains to document the payments to the foreign officials. CEFC received nothing in return for the payments, they said, a characterization that prosecutors disputed. "He made no attempt to hide what he was doing," defense attorney Edward Kim said. 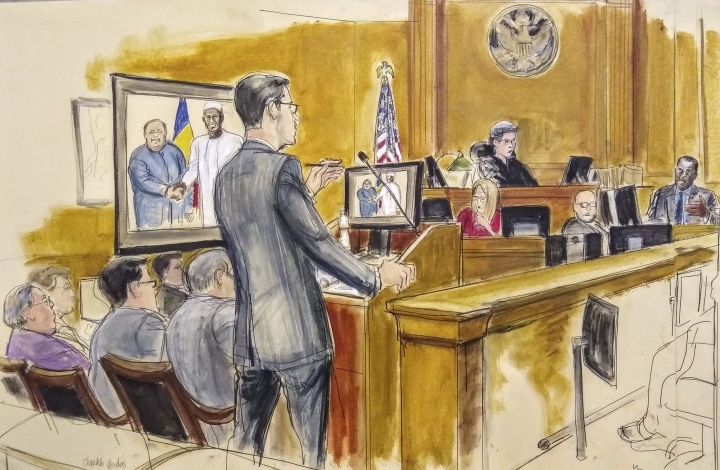 Perhaps the most colorful — and critical — testimony in the trial came from Cheikh Gadio, a former foreign minister to Senegal who had been indicted with Ho before agreeing to testify. Gadio told jurors Deby became enraged after his security team discovered $2 million in cash had been included in more than a half dozen gift boxes the energy company presented during a visit to the presidential compound. According to Gadio, Deby said his first impulse was to expel the company's delegation from his country. Gadio said the president asked him "why people believe that all African leaders are corrupt." Gadio said Ho told the president he was "impressed" by his refusal of the bribe . He said CEFC insisted the Chadian government keep the cash as a charitable donation. "This is not how legitimate business is done," Assistant U.S. Attorney Douglas Zolkind said. "It's bribery." Ho's defense attorneys claimed it was Gadio who suggested the bribe. "He has never taken responsibility for his actions," Kim said of Gadio. Ho also was charged with bribing Sam Kutesa, the foreign minister of Uganda and a former president of the United Nations General Assembly, and Kutesa's brother-in-law, longtime Ugandan President Yoweri Museveni.